MediBurn is the safe and simple solution for the disposal of infectious and pathological waste for medical facilities. It now includes an upgraded control system which provides up to 50% fuel saving with improved safety features and multi-lingual displays. MediBurn is available in two sizes, MediBurn30 and MediBurn20. The larger MediBurn30 is capable of destroying up to 30kg/hr of waste. Both models are portable, easy to use and will incinerate everything from laboratory and surgical waste to animal remains. The MediBurn is ready to use upon delivery. It features easy to operate controls with automatic pre-set cycle control for startup and shutdown. Dual chamber combustion with high exhaust temperatures in excess of 1000°C ensure clean burning of materials. SmartAsh is an innovative system for the burning of waste materials that meets US EPA requirements for burning non-hazardous refuse. Simply load a standard 208 litre open head steel drum, light the load and clamp on the lid. A whirlwind of fire and intense heat is created inside the drum, burning refuse without smoke or smell. Combustion is complete, leaving 3% ash. The SmartAsh can be used with or without fuel. For dry loads that support combustion, SmartAsh incinerates waste with incredible efficiency. 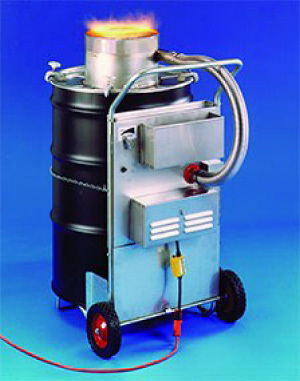 For loads having a moisture content above 15%, the SmartAsh with OilAway Attachment provides a unique fuel injection system that allows the incineration of a large variety of refuse and waste materials. SmartAsh with the OilAway Attachment also eliminates waste oil at rates up to 6 gallons/hr. (23 L). SmartAsh is available in in 110 volt and 220 volt versions.